In 1973, a group of Hatton residents came together with a dream: to establish an area museum for their community. They decided that they would name this museum to honor Hatton's most famous son, Carl Ben Eielson. This museum was originally located in the Anders Ness house and a grand opening dedication was held on July 4, 1976, as Hatton's Bicentennial project. About five years later, on June 16, 1981, the association purchased the Osking-Eielson house (Carl Ben Eielson's childhood home). Within a few months the Osking-Eielson house became the permanent home of the Hatton-Eielson Museum and the Anders Ness home was sold and is a single family residence once again. Both houses are listed on the National Register of Historic Sites. 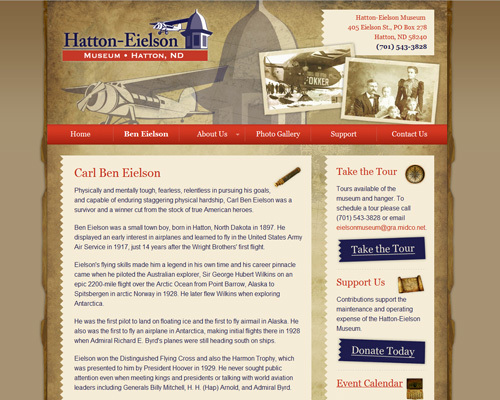 The Hatton-Eielson Museum is a non-profit organization. We hold North Dakota Tax Permit #23-7364649. The museum is run by an all-volunteer board that schedules and guides tours, cleans, and does all minor maintenance and repairs. Top of the World and Booster memberships entitle the contributor to free admission to the museum for the current year.